Students at California State University campuses from Humboldt to San Diego are holding rallies and teach-ins to spread the word about the 2017 stabbing death of Humboldt State student David Josiah Lawson, and to demand that black students and other students of color on CSU campuses feel safe and protected. It all started over a cell phone, some witnesses said. In the early hours of April 15, 2017, a house party in the small Northern California town of Arcata erupted in violence, leaving the 19-year-old Lawson dead. 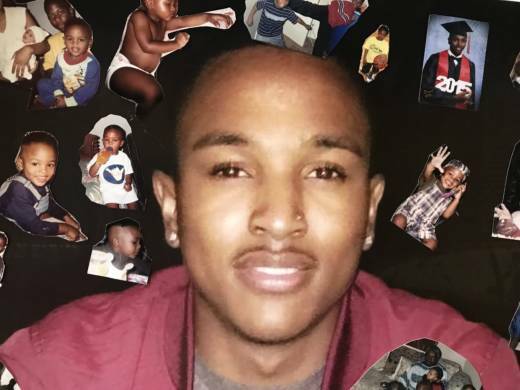 Lawson, known to his friends by his middle name, or as 'DJ' to his mother, was a black student at Humboldt State University, a handsome athlete studying criminology. He was recruited by HSU at a high school fair in his Riverside County hometown, all the way on the other end of California. What really happened that night is still unclear. But some details remain consistent. As the party was breaking up, some white residents accused Lawson and his friends of stealing a cell phone. The resulting brawl left Lawson pepper-sprayed and stabbed multiple times. Lawson died of those stab wounds. Some witnesses said Kyle Zoellner, a young white man from the area, was seen dropping something shiny. Zoellner was arrested, and then later released for lack of evidence. In June, Zoellner sued the city of Arcata, alleging police and city officials violated his civil rights. But Lawson’s family and friends say local police barely investigated the crime, failed to interview key witnesses, and ignored important evidence. The chief of the Arcata Police Department, Tom Chapman, resigned this past April, under a cloud of criticism over the handling of the case, including from an FBI consultant. 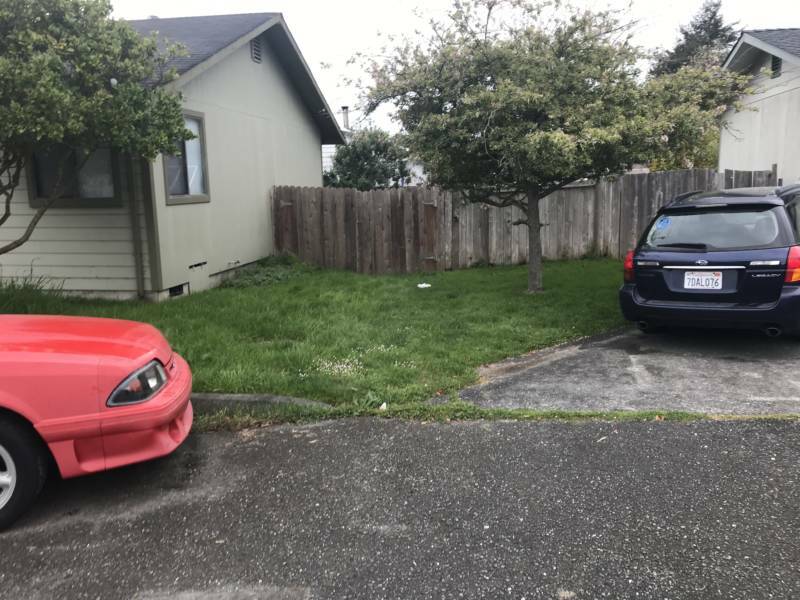 Arcata, where Humboldt State University is located, is a small and sleepy town in one of the northernmost pockets of California. This is marijuana country, known for an open, liberal culture of hippies and high times. It is also a very white part of California. Arcata is around 80 percent white, and many in the community say local residents are less than welcoming to students of color, like Lawson. It has been a year and a half since Lawson was killed, and his death remains unsolved. But this week, new light is being cast on Lawson’s case, across California State University campuses. At San Francisco State University’s Malcolm X Plaza on Monday, a group of students stood on a stage, behind them, yellow police caution tape and a banner that read “Justice for Josiah.” Underneath it, was a list of names of students who had been killed while attending CSUs. The list of names included Cory Clark, another black Humboldt State student who was killed in the nearby town of Eureka in 2001. In a bitter twist, Lawson was the head of Brothers United, a group of students at HSU that formed after Clark’s unsolved murder to support young black men on campus. The fact that people are still — some for the first time — talking about Lawson’s death, is due in large part to his mother, Charmaine Lawson. She’s been tirelessly campaigning to bring attention to his killing, and to ask for justice. But Charmaine Lawson, who has organized multiple vigils and rallies, and has taken her son’s case to the California State University Board, spent the year and a half marker of her son’s death working. Lawson said she is grateful that so many students from CSUs across the state have picked up the mantle. 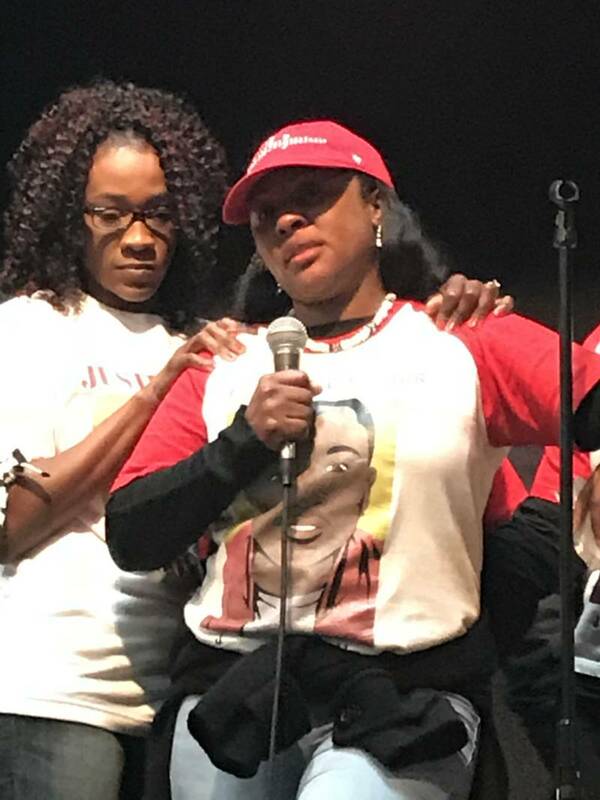 “My heart is filled with joy, and I’m so proud that the students and faculty and staff, just, you know, want to do so much to bring justice for our family, and for my son," she said. "So many people who are rallying did not know him. Everyone that is rallying, and showing their support did not know him." San Francisco State University student Akaelah Flotho did not know David Josiah Lawson. At the time he was killed, she was a student at a community college close to Humboldt State, The College of the Redwoods. Flotho said even before Lawson’s death, the animosity towards students of color in the area was palpable. “I was napping on the bus after like, a 12 hour day, and I was woken up, to my chair being jolted,” she said. She heard someone shout the N-word at her, and then they threw a metal object. She said she didn’t go to school for a week after that happened. “I was way too anxious [to take public transportation]," she said. “I’m still very scared." Flotho said that anxiety stays with her. That was before Lawson was killed. “A month later, I heard about Josiah, and I just had that, yeah, this is what students of color are talking about,” said Flotho. Flotho pointed to school pamphlets that featured diverse faces, and said they overrepresented the black population of Humboldt State Campus, without any warnings of the racism they could encounter from local residents when they get there. Many students applaud the efforts of CSU to create more diverse student bodies, but they added a warning. The bodies that carry the work and weight of diversification are not those of school administrators, they are the actual bodies of students of color. And if they are not safe, they asked, then who is all this diversity for? The buzzing fears of students of color in Arcata have now grown to a fever pitch. And their voices are spreading and merging with other students, across the state. Flotho was among a handful of students in Malcolm X Plaza on the San Francisco State campus, trying to spread the word about Lawson’s death. She lived right across the street from where Lawson was killed, but she wasn’t at the party that night. “I woke up that morning to texts and missed calls, asking if I was alright. They heard of the murder of a black student, and there’s very few of us up there,” Flotho told the crowd. Some members of the San Francisco State Black Student Union only found out about what happened to Lawson this summer. “As black students, were very well aware of our historical legacy on college campuses throughout the state of California and throughout America,” said Damion Square, an SFSU student and Black Student Union leader. “Our bodies, our spirits, our personalities, have never been respected. And we're still fighting for the dignity and the right to exist. Josiah was a part of the struggle." “CSUs are unsafe for black students right now,” Square said. It is not just physical violence, he added, pointing to housing and economic insecurity as factors, which threaten black students' ability to attend college. Square is a senior, double majoring in Africana Studies and Media Research, but he can’t afford to live near campus. He lives in Santa Rosa, making the hour and a half commute each way, four days a week. “I’m working two jobs to feed myself, and I’m doing it all on my own at a college where black students originally founded the College of Ethnic Studies, and the first Black Student Union was started here,” he said. In the intervening 40 years, he said, there has been progress, but it has been minimal. "We're still fighting for those basic rights, that we should have as students," Square said. Housing isn’t just an issue for students in the expensive Bay Area. Flotho said it was a problem for students of color in Arcata, too. “Trying to find housing, landlords who will rent to you, it’s all a very hostile experience," she said. But Square and Flotho know, even those vital details pale in comparison to physical safety and what happened to Lawson. The office of California State University Chancellor Timothy White said he is actively pushing for a resolution to the case. He was in Arcata recently, meeting with local police. 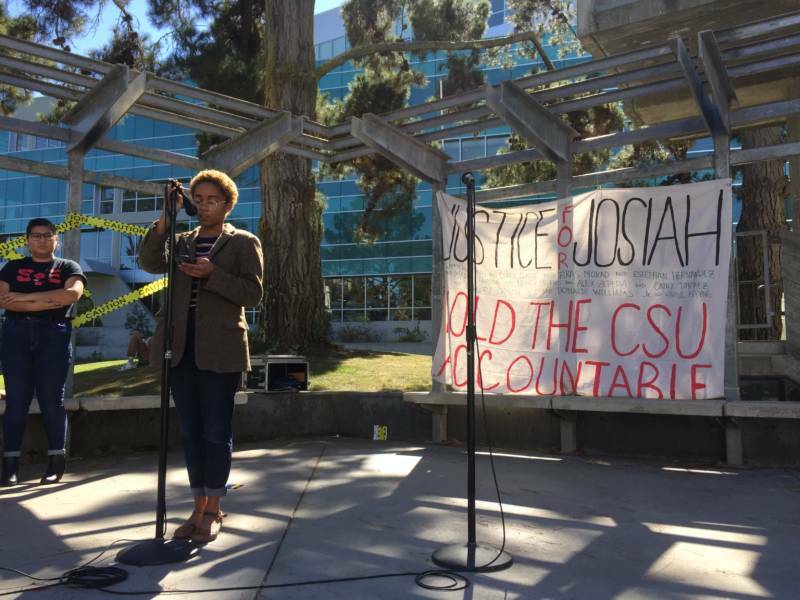 Charmaine Lawson will join other CSU student protests this week, keeping the memory of her son alive and demanding justice in his name. Lawson is heartened by the work of the interim Arcata police chief, Richard Ehle, on her son’s case. “The investigators that he has now working the case, they really had to go back, they really had to start from scratch,” she said. For the first time, she is hopeful her son’s killing will not remain unsolved. This week, so are students across the CSU system.